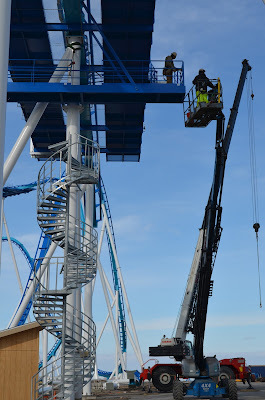 Yesterday was a big day for Cedar Point as the park lifted the last of the 102 track pieces that make up GateKeeper into place, completing the coaster's 4,164 foot course. 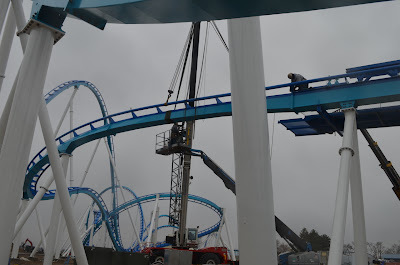 Up goes the last piece of track! GateKeeper starts with a 170 foot tall lift hill along the beach before flipping riders upside down at that height. The ride will soar down the first hill, reaching a maximum speed of 67 miles per hour. 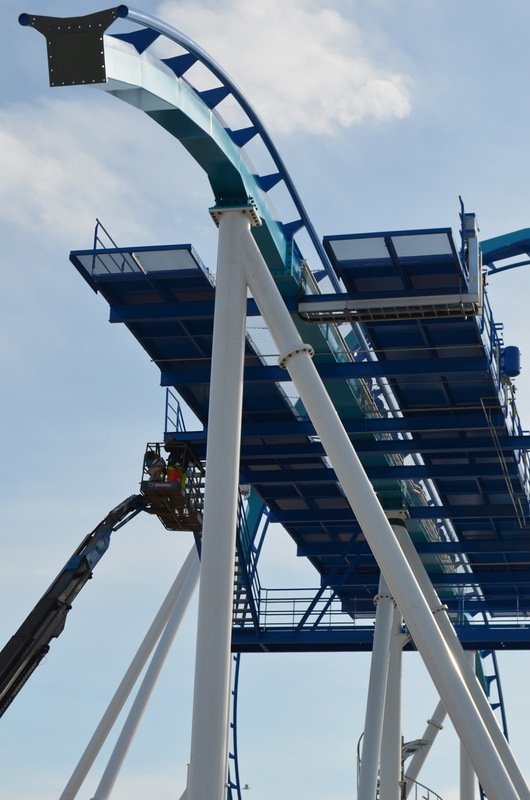 With seats suspended from the car, there will be nothing above or below riders while on the coaster. Cedar Point is spending an estimated $30 million on GateKeeper along with renovations to the main entrance gates and plaza. 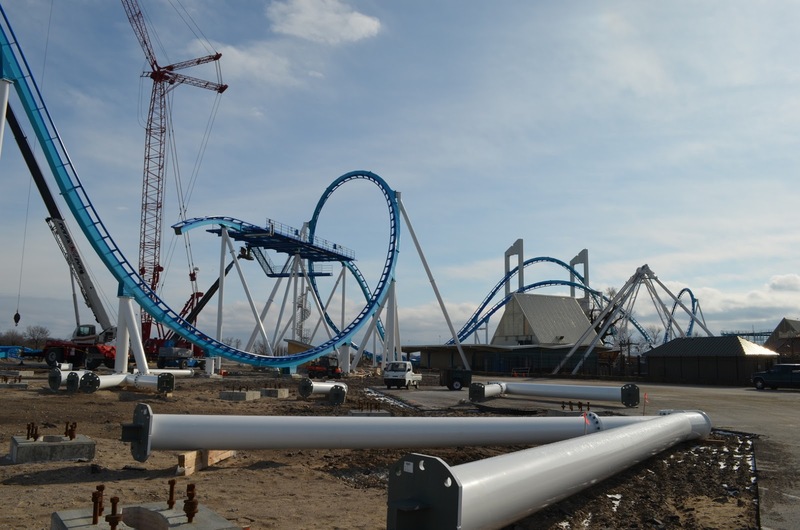 According to the park the ride will break seven world records including "tallest drop, longest track and most inversions of any winged coaster on the planet." Congratulations to Cedar Point on finishing the ride ahead of schedule, we can't wait to see the trains get on the track for testing! 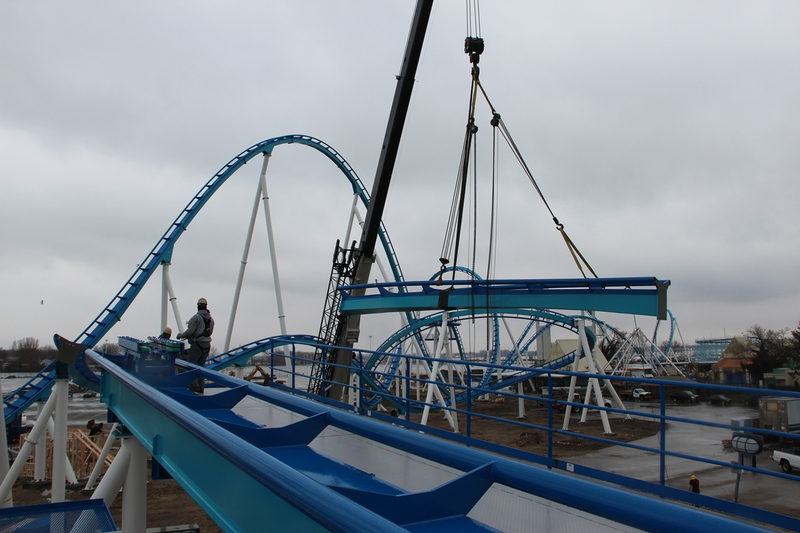 Cedar Point will open, along with GateKeeper, in just 71 days on May 11th, 2013. As soon as Summer 2016 visitors to the Blue Mountain Ski Resort, located in the Poconos in Pennsylvania, will be able to splash the day away at Summit Splash Water Park. The $30 million full-fledged outdoor water park is set to start construction soon, with the general contractor already on board. The park has been planned for years now, and will give the resort a full roster of Summer activities - obviously the Ski Resort aspect of Blue Mountain's name means that they're pretty busy in the Winter. 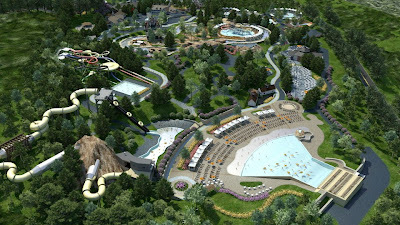 Camelbeach water park, located only 30 miles from where Summit Splash would be built, has proven the concept can work. Camelback Ski Resort operates similarly, with a busy ski season and then a full water park for the warm months. 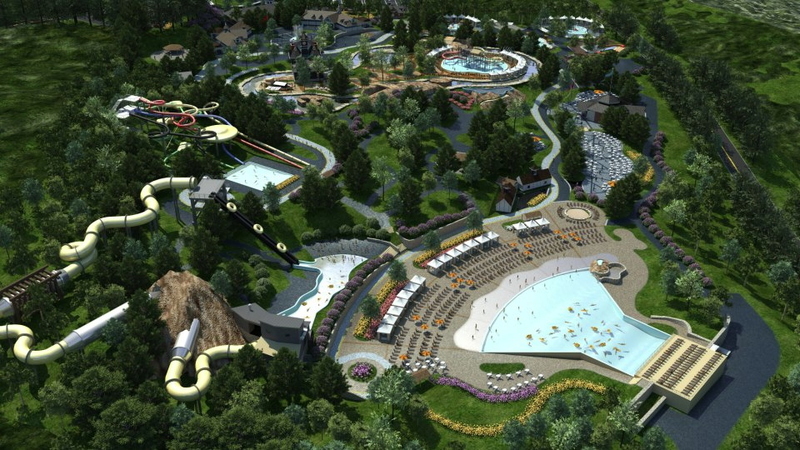 Summit Splash would feature a gigantic wave pool, lazy river, and several sets of slides. The concept art shows one slide that would pass through a mountain structure and into a building before hitting the splash pool. Future additions would make the park eventually cover up to 60 acres of the resort. With the existing Camelbeach water park only 30 minutes away to the Northeast, and Dorney Park's Wildwater Kingdom only 20 miles away to the South, one has to wonder if the new park will overly saturate the market. Blue Mountain plans a 110 room hotel to accommodate new visitors - the Poconos are famous for pulling New York and New Jersey visitors - so perhaps there is room after all. We shall see! 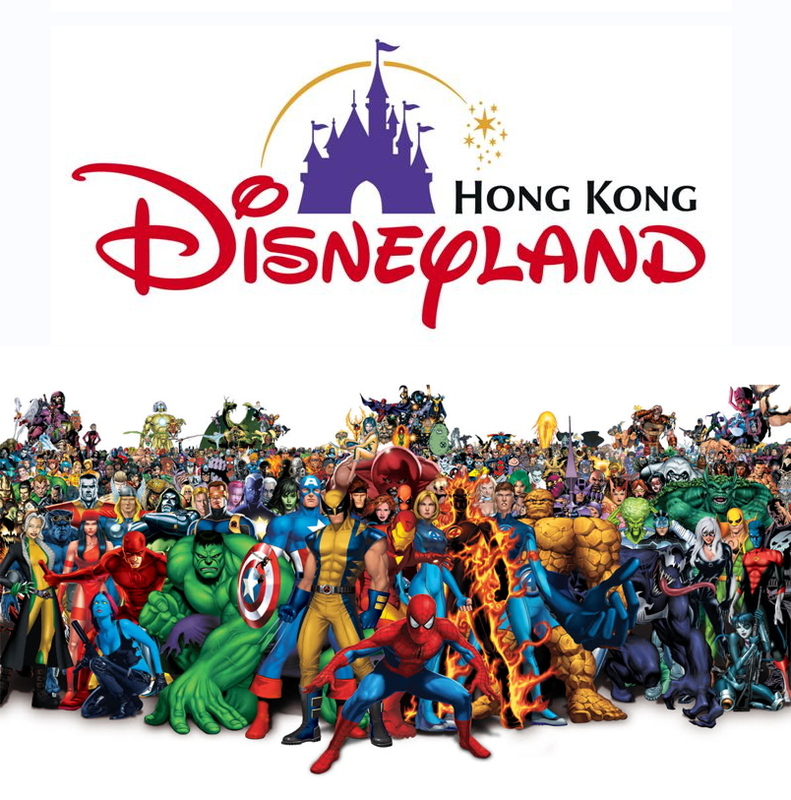 Far from an official Disney announcement, the Wall Street Times is reporting that the Hong Kong Financial Secretary has been quoted as saying that Hong Kong Disneyland will add a Marvel themed areas as part of an upcoming expansion. Granted since the park is 52% owned by the government an official's words do bear some weight as far as the future goes. With the park's third mini-land expansion set to open this year I wouldn't be looking for any Marvel themed area to open any time soon. 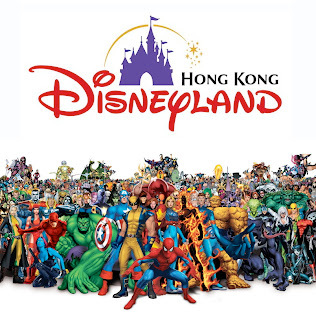 Since Disney spent a cool $4 billion on Marvel a few years ago everyone has been waiting to see how they would be incorporated into the theme parks. Obviously movies and retail have been successful for the franchise, but the possibility of Marvel rides is almost endless once the Imagineers are unleashed. This will definitely be a story to follow in the future as plans develop since it very well could set the pace for the brand to be used in other parks, including those on American soil. 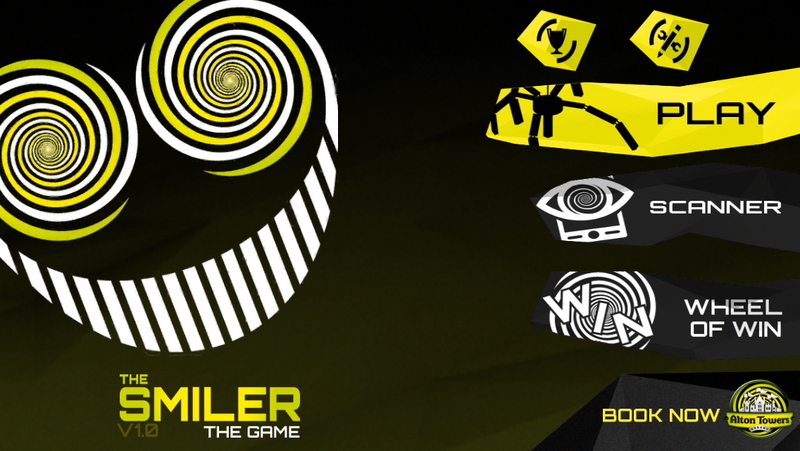 Alton Tower's Smiler now has its own mobile game, appropriately titled The Smiler: The Game. Many folks were really looking forward to the game to see if it reveals new details of the secretive coaster, but I'm not sure that too much new is included. 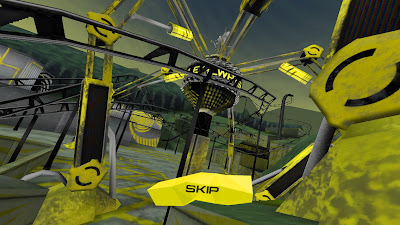 The game does have seven "Top Secret" elements that you cannot unlock until May, which keeps the ride's mysteries intact. There's also a built in scanner that lets you scan images both online and at the park for bonus stuff. 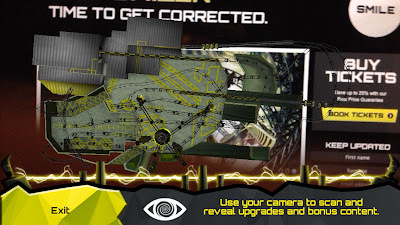 Above is a screen shot of me holding the game up to the concept art on the website, which makes this more accurate layout of the Smiler pop up. Pretty neat. The Smiler app is available currently for both Apple and Android products. Really though, Six Flags Fiesta Texas' Iron Rattler may be basically complete at this point, and we've seen the ride's layout in detail many times at this point - but who doesn't like seeing new photos like this one? Taken from the top of the ride's 180 foot tall lift hill, this photo shows almost all of the Iron Rattler's layout. Amazing, isn't it? Back on ground level the ride is just as impressive, showing off it's super steep 81 degree first drop and interaction with the quarry walls. This shot is from Jeffrey Seibert's Twitter account. Who could ask for a more beautiful blue sky as a background? 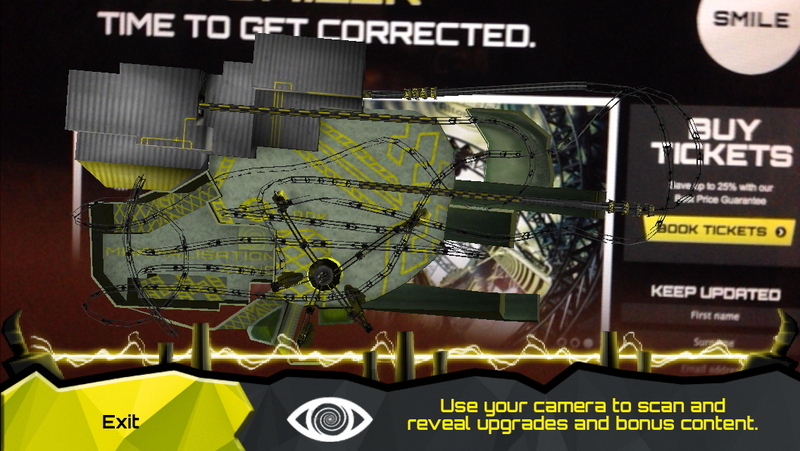 Now that the ride is basically complete we can start to wait for testing videos! 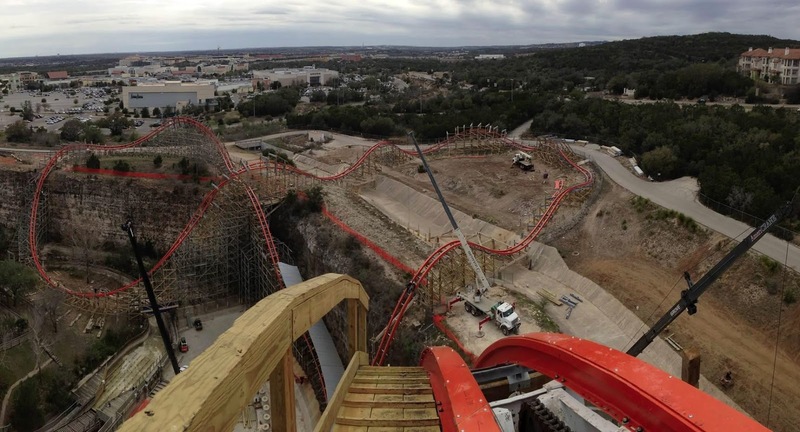 I think it is going to be beyond crazy just how fast the Iron Rattler takes its course... can't wait. 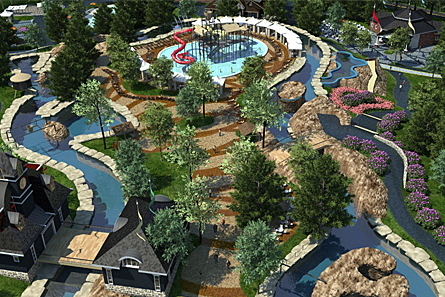 New for the Summer 2013 season at Magic Springs & Crystal Falls, located in Hot Springs, Arkansas, is Splash Island, a giant interactive water play structure. Perfect for beating the Summer Arkansas heat, Splash Island will stand more than four stories tall and "feature 10 colorful water slides, an enormous tipping bucket that dumps 1,000 gallons of water every ten minutes and more than 200 ways to get wet and stay cool." The park is confident that the slides, bubbler jets, water wheels, tipping buckets, water curtains, net climbs, pools and waterfalls will please the crowds. 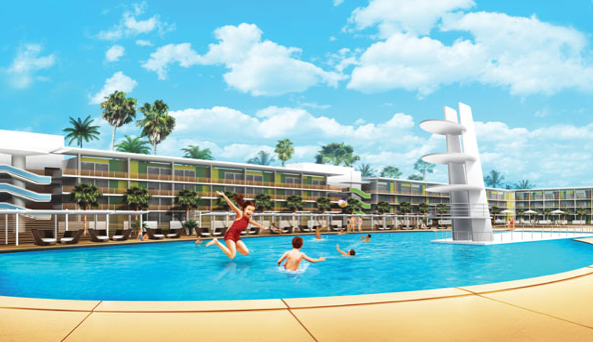 “With the addition of Splash Island, our guests will have another new way to be active, stay cool, and have fun as a family. 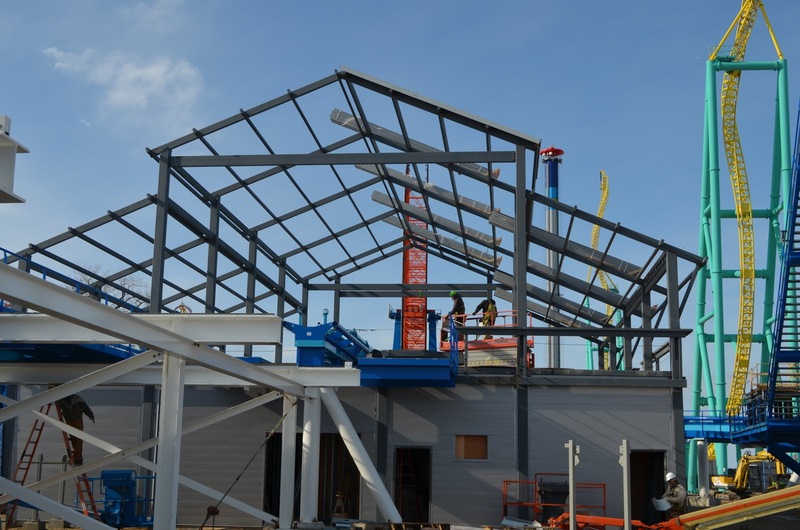 Plus, in addition to the water play elements, this major water park addition will include new seating, shade and room to relax", says the park's General Manager Steve Honeycutt. The multi-million dollar expansion also includes significant new lounging space next to Splash Island, including plenty of shaded areas. Magic Springs will open for 2013 on April 13th, and Splash Island has a targeted opening date of Memorial Day Weekend. I know we've had a lot of Fun Spot America updates lately, but that's because the park just keeps on building things so quickly! 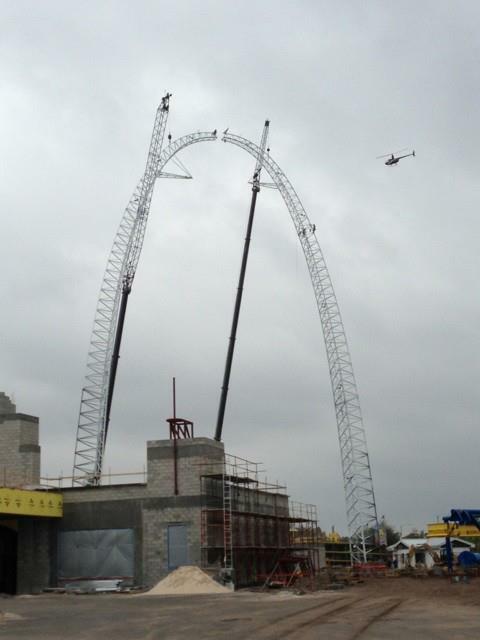 This past weekend saw the park's 250 foot Skycoaster lifted into place. Seen above once completed, the ride has forever changed the skyline of both the park and the surrounding area - looking great even on a cloudy gray day. The SkyCoaster, which has received a coat of white paint, will only use one of the launch towers even though the ride has two. This SkyCoaster hasn't stood upright since it was located at the MGM Grand Adventures Theme Park many years ago. It's great to see the ride get a second lease on life! If you are looking to book a trip to the Universal Orlando Resort you now have a new option, so long as it is after March 31, 2014. Guests can now book reservations for the all-new Cabana Bay Beach Resort at Universal Orlando from that date going forward. That means the race is on for the resort to be built, with a deadline of just over a year from now. Along with the news came the above new concept art, along with some additional details about the property. When completed there will be 900 standard rooms and 900 family suites set among two courtyard sections, easily labeled North and South. A central building will contain a restaurant serving American favorites along with a 10 lane "retro" bowling alley. The North Courtyard and its 600 family suites will open first. "Inspired by the sweeping motor courts of the 1950s and 60s, it will feature four-story buildings with open corridors and direct access to guest rooms. The suite buildings will surround a more than 10,000-square-foot, zero-entry pool with a 100-foot water slide, waterfall features and 4,000-square-foot interactive play area." Later in 2014 the South Courtyard will open, with the rest of the rooms and an even bigger pool area. 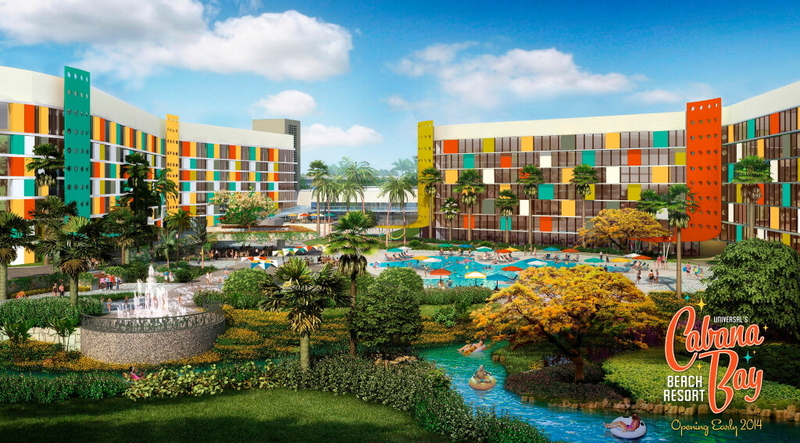 "An 8,000-square-foot, zero-entry pool with a 6,000-square-foot sand beach will offer plenty of entertainment options, including the first lazy river at Universal Orlando Resort, a 700-foot-long feature offering multiple interactive zones. In addition to 300 suites, the towers will feature 900 guest rooms that are each 300-square-feet and that sleep four and include two queen beds and mini-fridge." As a mid-priced resort the individual rooms will start at $119 per night, and the family suites at $174. Room rates will lower depending on the length of stay and packages that include the theme parks will be available. 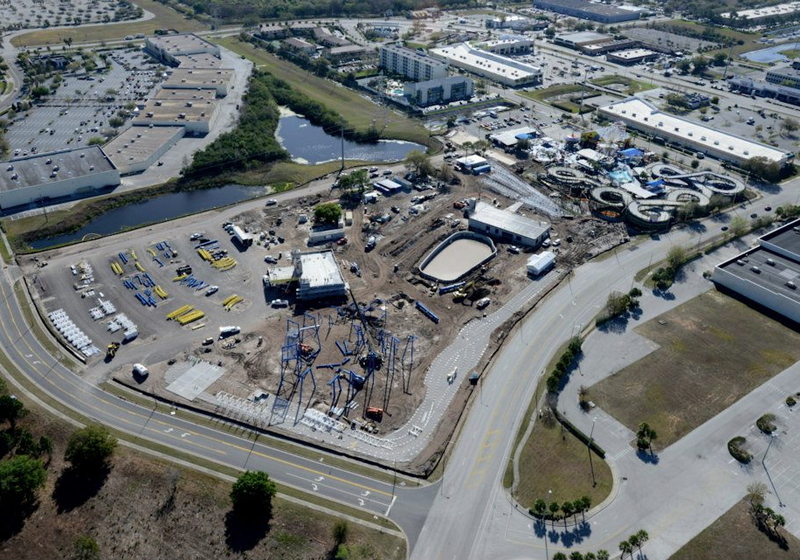 The Orange County Property Appraiser website has uploaded some fun new aerial photographs taken in January that show off the work going on at the Universal Orlando resort. 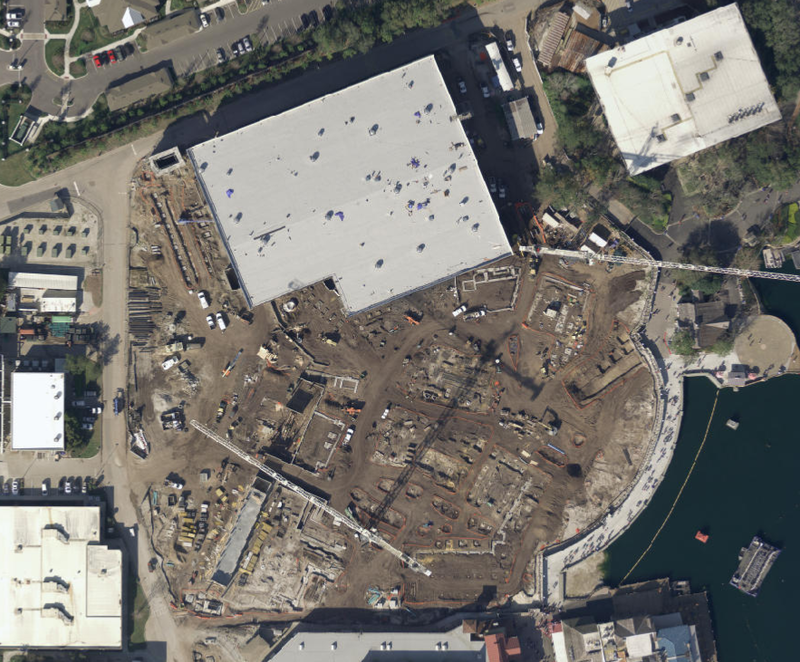 Above is the biggest project at the moment, the rumored (I only say rumored because it is not official, but we all know what is coming) expansion at Universal Studios Orlando of a London version of Harry Potter's world. 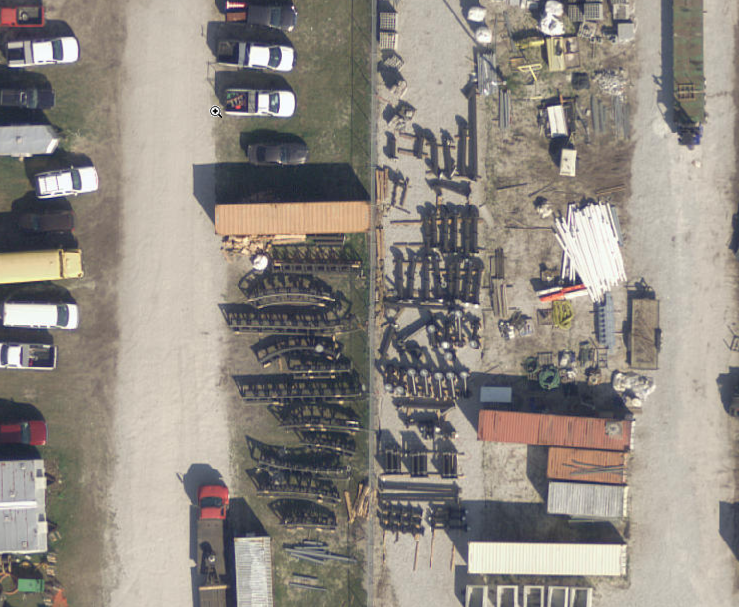 I have to give credit to Park Rumors for finding the new aerials. They have done a great look at all the construction in this article, including following the footers that have been poured for the train ride that will connect the two Potter-lands when complete. The aerials show off the work going on at Islands of Adventure as well, to slightly expand their Wizarding World to include a new train station. 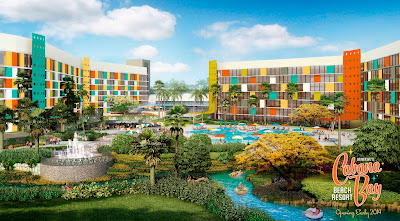 The park's latest resort, the Cabana Bay Beach Resort, can also been seen in its early stages. Since the photos were from January the resort has made much progress since. Transformers is also up, though not much to look at from the air (a big box). While I was sad to see Jaws go looking at the work going on for its replacement is quite exciting! Now we just need a official announcement with some great concept art. I know that children's areas aren't that exciting, but I gotta focus on something until new aerials come out! 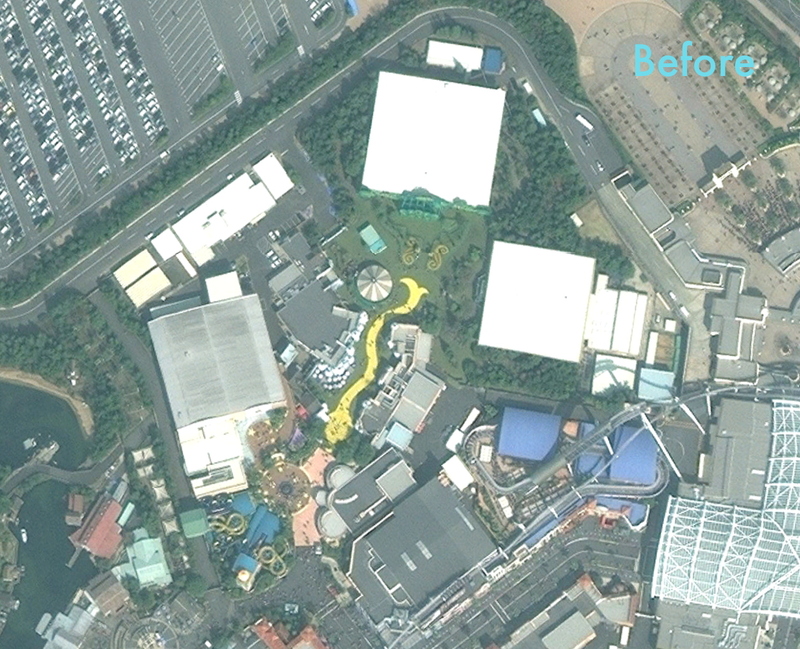 That said, let's check out last year's addition of the Universal Wonderland at Universal Studios Japan. This section of the park originally housed the Wild Wild Wild West Stunt Show in the theater that is in the top of the photo. The buildings around it were appropriately Western themed, though I can't say I know what the white building on the right was used for. The large one on the left holds Snoopy Studios, an indoor area complete with kiddie coaster. A large set of wet/dry slides stand at the entrance to the Studios building. Later, and as it appears in the photo above, the upper section received a Wizard of Oz theme. The theater at the top showed an abbreviated version of Wicked, and there was also a yellow brick road and Oz themed carousel. The park decided that the entire area needed a refreshing for its 10th anniversary, and it sure got one. Starting at the top the former theater became a part of Sesame Street Fun Zone, including indoor attractions akin to Snoopy Studios. The Sesame Street Area also has many outdoor rides for kids divided into the Plaza and Central Park areas. The building that used to be on the right is now home to many of those rides, including a large driving school style ride. Moving south we encounter a pink area that is dedicated to Hello Kitty, ever popular in Japan. In the Hello Kitty Fashion Avenue guests can buy tons of merchandise in stores or take a spin on the Cupcake Dream tea cup ride. Finally, the area in front of the Snoopy Studios building got a fresh makeover with a central new ride as well. Known as the Flying Snoopy, the ride lets folks take a spin on a flying Snoopy. A fitting name, indeed. Universal Studios Japan is currently building their own version of the Wizarding World of Harry Potter in a former parking lot, but sadly that work had not started when these aerials were taken (courtesy of Google), so we will have to watch to see when they're updated for those! Cedar Point has sent out a new batch of GateKeeper construction photos, showing off the ride's latest developments. 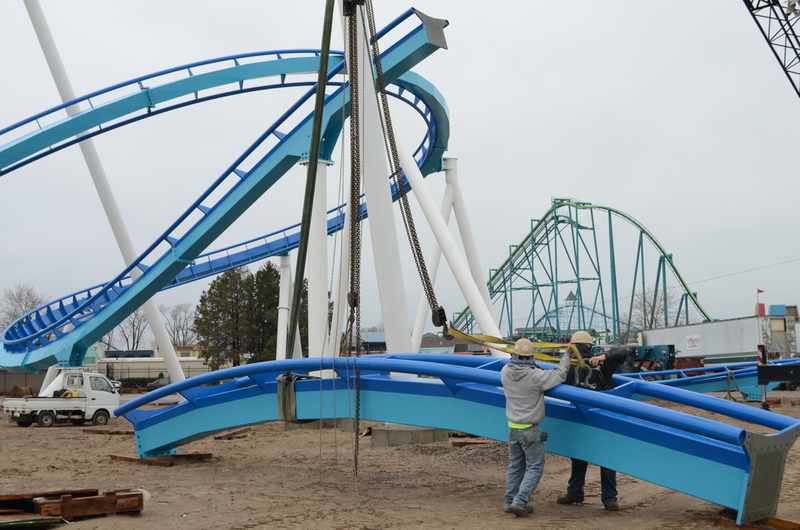 The park has set the mid-course brake run into place, which stands in the middle of the ride's enormous corkscrew. If the concept art holds true then this section of the ride, which takes place over the former parking lot, will be nicely landscaped. The remaining parking lot between the coaster and the rest of the park will be for employees. The mid-course brakes allow for three train operation, a must at Cedar Point to keep capacity up. The trains will give riders a brief pause as they pass over it, then dive back into a helix. In all, the park reports that there are only 18 track pieces out of 102 left to go up. This photo shows the supports and footers for GateKeeper's helix, the ride's final element. Before any thrills though, the ride needs a station to depart from! Here's a progress update on GateKeeper's homebase if you will, and it look like it is starting to have its roof applied. The "downstairs" section is now enclosed so that work can move further along. 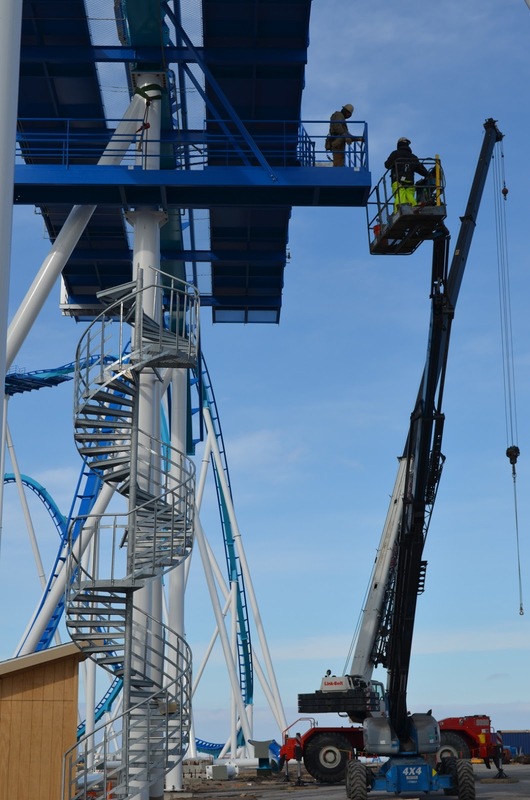 If all goes well the ride should be complete before the week is out, according to Cedar Point. Can't wait! 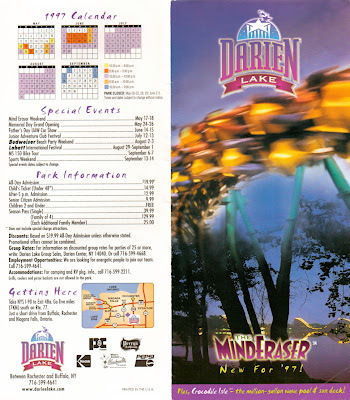 From The Vault recently featured some materials from Darien Lake's 1996 season and I just came across items from 1997 and thought it would be fun to look at those as well. The park was in mega-expansion mode back then and each season saw plenty of new stuff to check out. In 1996 a brand new kids area was added to the park - named Popeye's Seaport - and that allowed the park's older kiddie area to be demolished for new water park stuff. But wait I'm getting ahead of myself. The point is that Premier Parks, before they purchased Six Flags, had bought the park and immediately started expanded. 1996 was almost a prep year for future expansions, specifically needing to get rid of the old kiddie area. New York's New SuperPark is a pretty bold name for yourself, if you ask me. 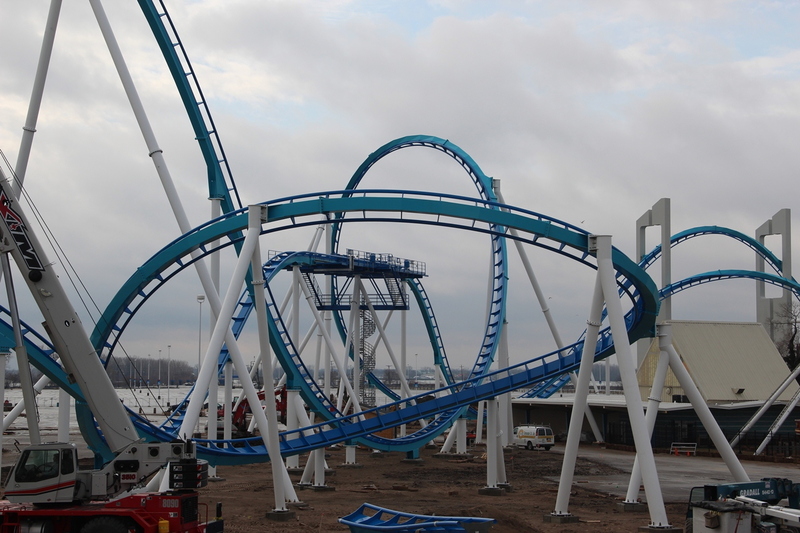 Adding a brand new $8.5 million inverted roller coaster doesn't hurt with that claim, though. 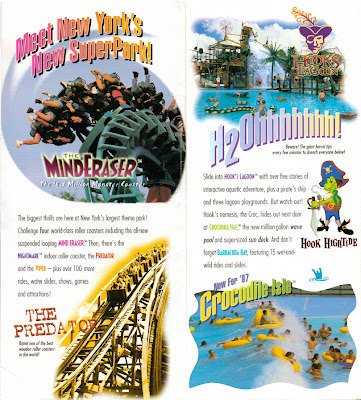 The addition of Mind Eraser was similar to that at other Premier Parks across the country, and the chain had great success with them - even if the rides they provided are less than... comfortable. 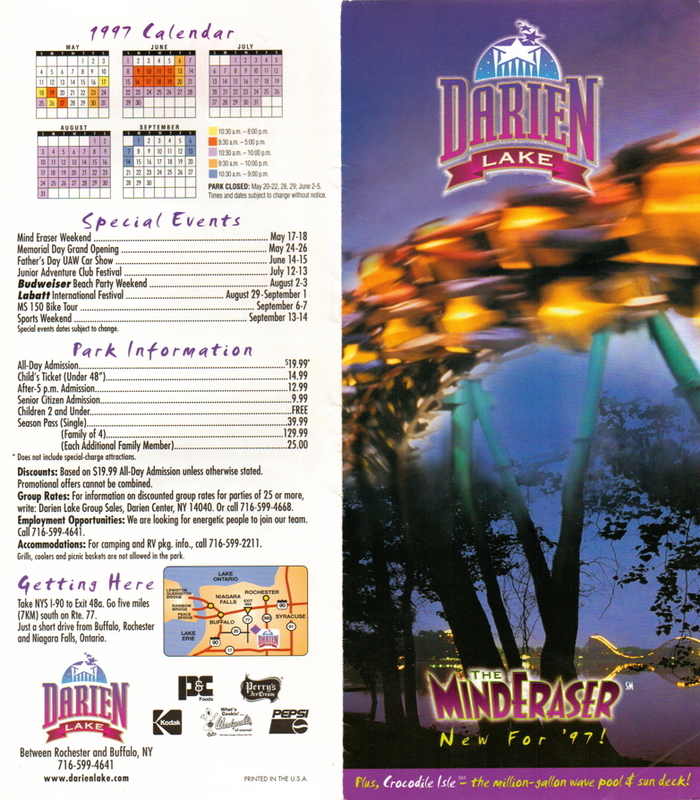 Mind Eraser allowed the park to advertise four coasters, including Nightmare (indoor coaster added the year before), Predator and Viper. The previous year's Hook's Lagoon water play area was just a taste of bigger things to arrive in 1997 - namely Crocodile Isle, a million-gallon wave pool. The wave pool was placed where the former kiddie area was. See? This is all starting to make sense. The Popeye kiddie area was a hit the year before, and it probably helped guests to forget about the old kiddie area that was now a wave pool. 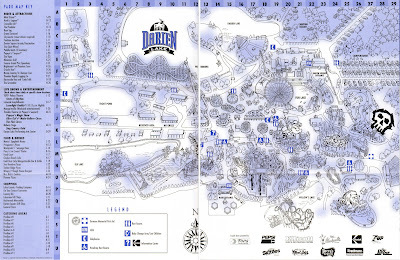 Darien Lake needed more space to grow their water park, and even with the new wave pool in a large open space an awkward bridge was still needed to connect guests to the existing slides. 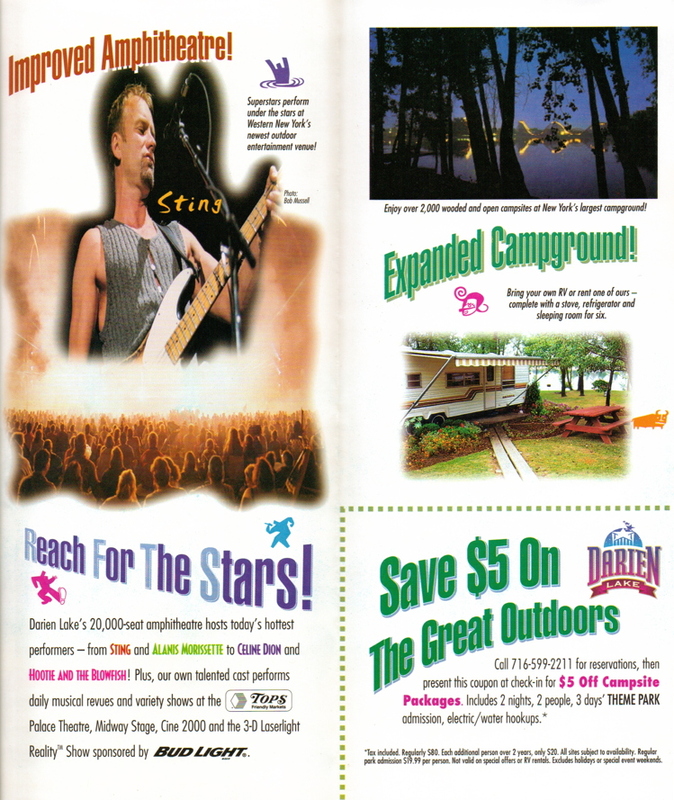 Concerts are still a pretty big deal for Darien Lake today, and it appears as though they had some big names (for the time) playing at the park. I mean Celine Dion, really! And don't forget to bring the camper to the park so you can relax a bit and make the trip a weekend long adventure. 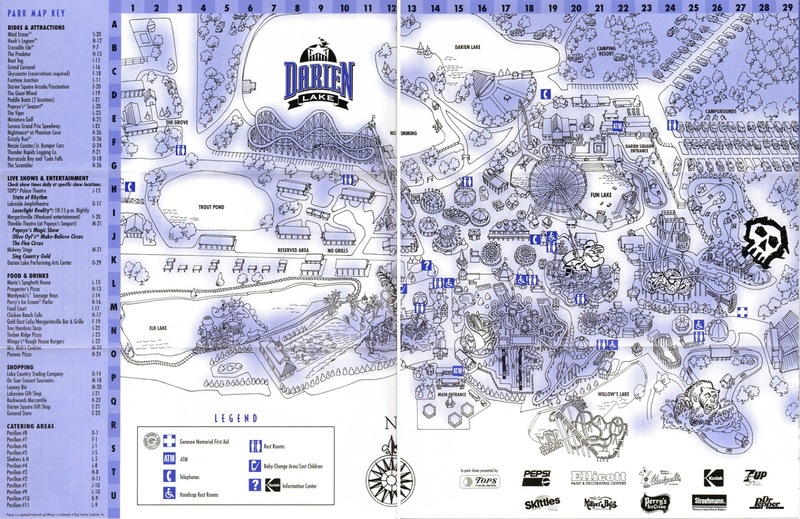 Just for good measure I wanted to include the park's map from 1997 as well. You can see the new wave pool over on the left, extending the grounds of the water park. 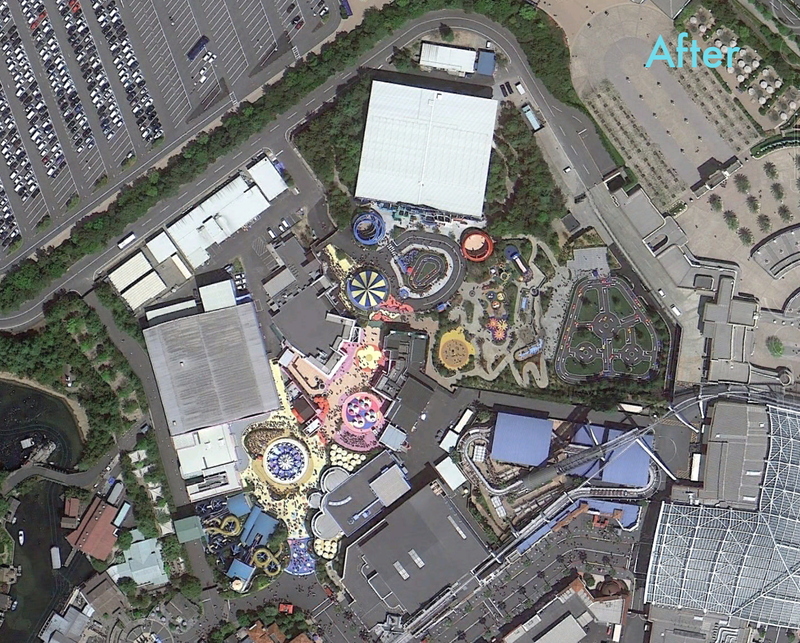 I'm not sure what was going on with the purple blotches on all the rides, it almost makes the property look a bit sickly! 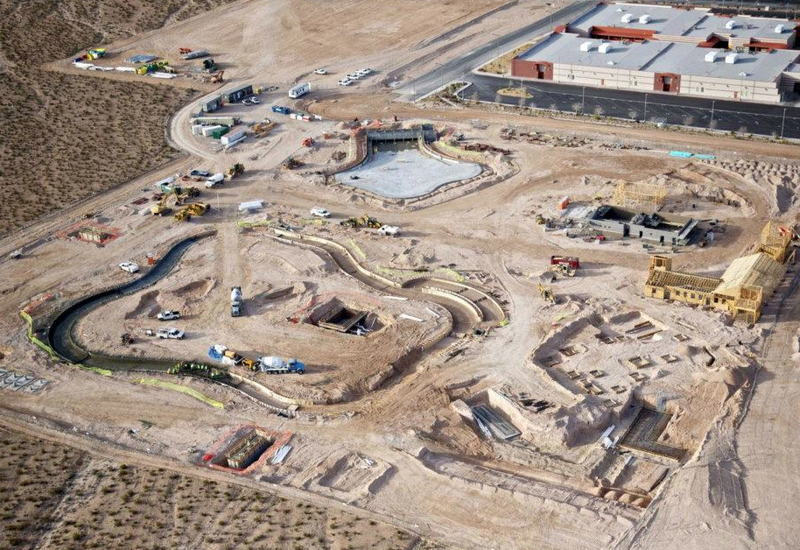 I haven't been paying close attention to the construction of either of Las Vegas' new water parks, but Wet 'n' Wild has made quite a lot of progress lately. This aerial of the all-new water park shows off what has been done so far. You can see the wave pool has been poured, and the lazy river is well under way. 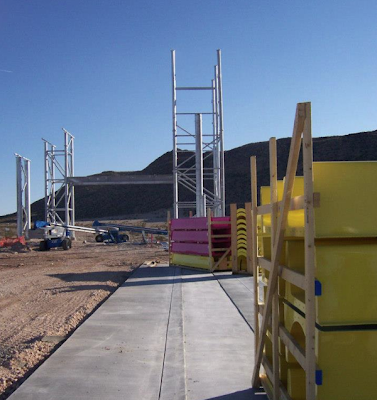 Lots of footers for the slide towers are in place, and some of the admission and other facility buildings are standing. They're making pretty quick work of things! And speaking of the slides that will populate the landscape of the water park, they've started to arrive in droves. 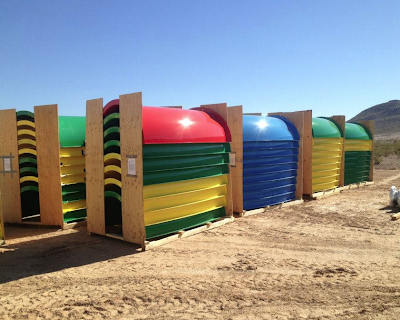 This colorful selection of slide pieces are patiently waiting to be hoisted into place. Four different slide towers will each have multiple rides stemming from them, with slides that range from mild to wild. Fast forward to even more recent photos, and some of the slide towers are now standing. The one above will be the starting point for Desert Racers - a multi-lane mat style racing slide - and Canyon Cliffs, which is a pair of steep dropping thrill slides. The $50 million development has a planned Memorial Day grand opening, so we're sure to see plenty more of the park going up - and quick. More info is available on the official Wet 'n' Wild Las Vegas website. What progress! 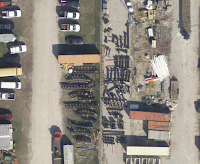 Fun Spot America has released a handful of new aerial photos, showing the park's enormous expansion as it currently stands. The blue coaster that has a plentiful amount of supports up is the Freedom Flyer, the park's Vekoma family suspended coaster. 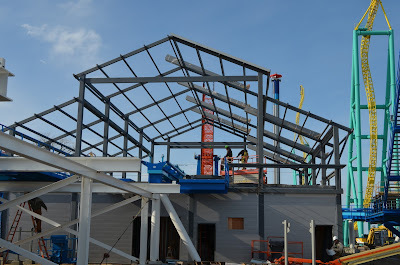 You can also see the now complete looking footers for White Lightning - GCI's first steel supported wooden coaster - as well as a small portion of it standing. The stacks of steel supports are in the newly paved parking lot just waiting to go up - along with plenty of track and supports for Freedom Flyer. The large building in the center of the photo is the park's new entrance, and just beyond that on the right is the now completed (but not filled) pond that the 250 foot tall Skycoaster will tower over. Before long additional rides and attractions will start to dot the landscape and then before we know it the park will be open! Okay perhaps I'm getting ahead of myself, but it is still great to see such progress being made so quickly. 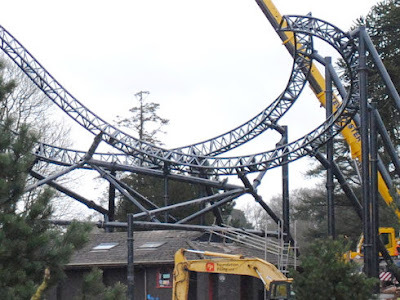 Alton Towers' The Smiler to Feature Inverted Drops? Construction slowed for a bit, but now Alton Towers is back at building The Smiler, and they've released some new photos that are quite intriguing. 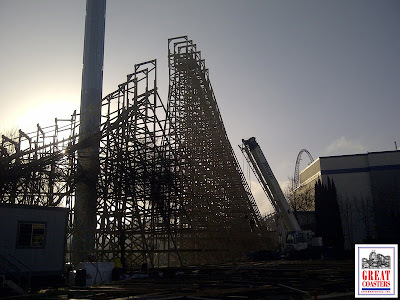 From the initial layouts released ages ago it appeared as though the ride would have two lifts, one normal and one vertical, each followed by a swooping 180 degree turn and then a steep drop. Well, now that this part of the ride is going up there seems to have been some additional secrets the park was keeping, secrets of the inverted nature. The new photos show the swooping turns described above, only at the end of them both appear to turn riders upside down! 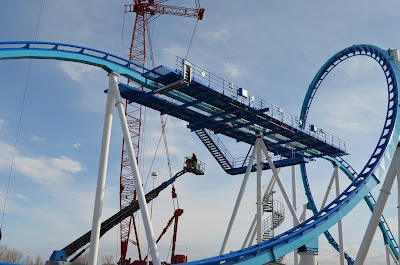 I can't wait to see how the rest of the actual drops look once they go up, but this development ads another pair of inversions to an already twisted ride. 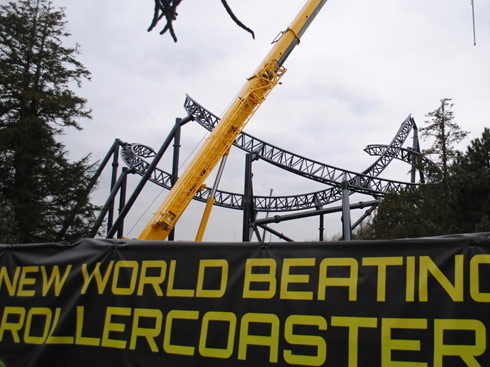 Speaking of that, it could now appears as though the Smiler might really make a go for the world record of most inversions. The initial plans for the ride showed eight inversions, and these additional on the drops make that ten. With more ride taking place inside a secret building, who knows how many the final count may be? It is now safe to say that 2012 was a good year for amusement and theme park operators. With earnings previously in from the other big chains, Six Flags Entertainment Corporation has also announced that they've had a record year as well. The full details can be accessed from this press release put out by the company, and just like Cedar Fair did earlier this week Six Flags also had a conference call to discuss the results. Here are some highlights from that. • For 2012 total attendance grew 6% to 25.7 million guests - that's an extra 1.4 million visitors across all parks. The chain also reports having record high safety metrics and guest satisfaction levels in the areas of safety, cleanliness, and value perception. • Total revenues for the year were $1.070 billion, an increase of 5.6% over 2011. EBITDA hit a record high of $383 million, at a margin of what the company calls an "industry high" of 39%. The company has increased their margin from 24.4% in 2009 to 39% in 2012, which is pretty impressive. • Much like Cedar Fair's recent focus, much emphasis has been placed on season pass sales. 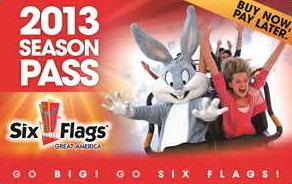 Six Flags sold a record amount of them in 2012 and also have double digit increases so far in 2013 over last year. • Individual per capita for 2012 was $39.41, seven cents more than last year. The gain was from an increase of eleven cents from admissions and a loss of four cents for in park revenues. Season pass attendance reached 40% of overall visits, which Six Flags says weakened their per caps. Interestingly Cedar Fair also hit 40% of their attendance from season pass visits, but saw substantial gains in admissions and in park per caps last year. • The 4th quarter saw record attendance levels for Halloween and Christmas celebrations. The quarter saw revenues increase almost 5% and attendance up 3%. The company credits this with investments in the promotions - and did not mention bad weather in the quarter like Cedar Fair did as a reason for their softer results. The Halloween and Christmas events will continue to expand in the future. • In park spending was up for the 4th quarter, due mainly to "premium attractions" like haunted houses and mazes, which are pay extra at Fright Fest. It sounds like the parks depend on that revenue, so I would not look for the pay-extra aspect of the haunts to go away any time soon. • Six Flags Mexico had several record days during their Halloween events, which were a first for them in 2012. The park overall sounds like it is thriving, and they talked up the spinning coaster they are about to open there in a few weeks. • The roll out of season pass dining passes is taking place this year, after being tested in two parks last year. The tests were very successful and the company sees this as a potential solid revenue stream this year. It was mentioned by the park earlier this winter, but now it is official: Batman: The Ride at Six Flags Great America will be running backwards for a limited time this season. 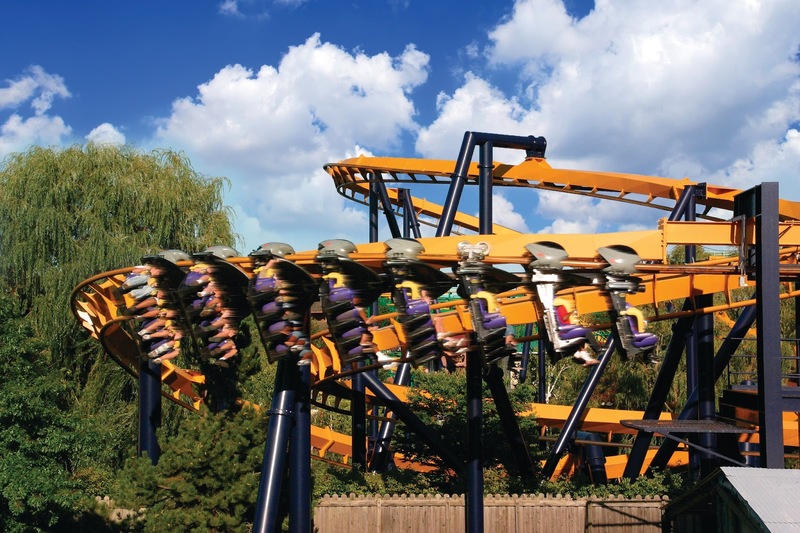 The first Batman inverted ride will start its backwards stint on May 4th, when the park opens to guests for the 2013 season. 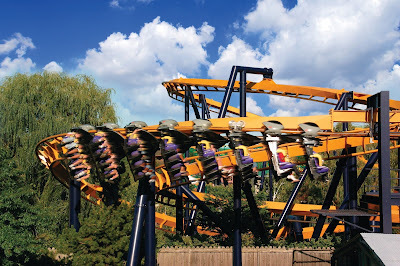 The backwards version of the coaster - the creation of which is said to have had a lot of involvement from manufacturer B&M - is only a limited time promotion, though an ending date has not been given. 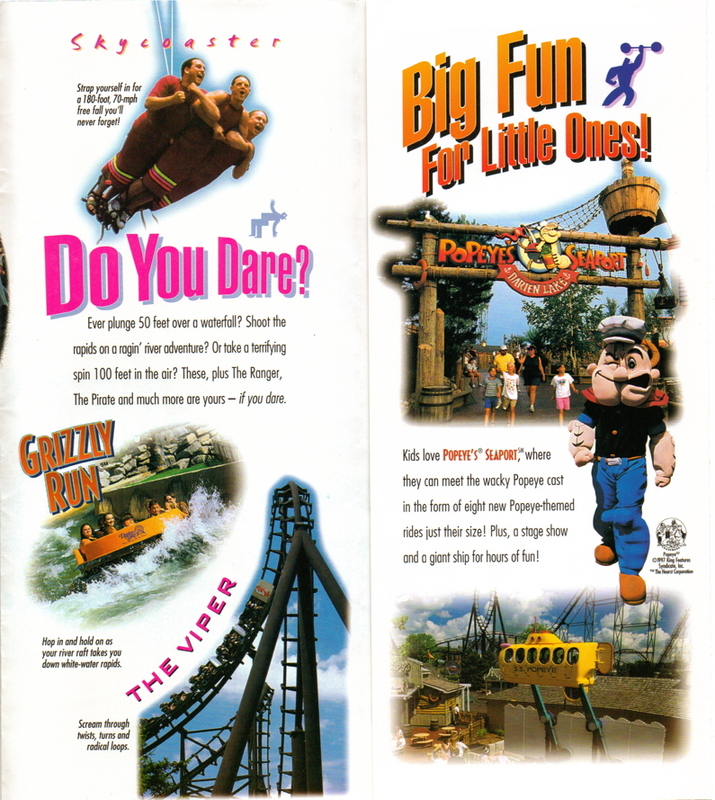 Since the coaster opened in 1992 it has given an amazing 28 million rides. Passengers will traverse 2,700 feet of track at 50 miles per hour backwards, heading through five inversions during the ride. Already known as one of the more intense rides out there, Batman: The Ride Backwards is sure to be even more so during this special event! With construction almost complete on the ride's track, California's Great America has announced a new world record that Gold Striker will hold when it opens this Spring. Gold Striker will now include the "world's longest covered initial descent tunnel on a wooden coaster." As described by the park's press release, "adding intrigue to the record setting feature, Gold Striker's 174-foot tunnel will be enclosed by wood on both sides, corrugated metal on top and in-fill underneath the tracks, to replicate a true gold mine feel. The only visible light on Gold Striker's initial descent, which will hurl riders down a 50 degree slope at almost 54 miles per hour, will be following the first turn, creating a nearly pitch black visual." The framing for the tunnel can be seen on the recent construction photo above, from the ride's builder Great Coasters International. Their full gallery of construction shots can be seen at this link. "This fully-enclosed, twisting tunnel truly is a special element among wooden roller coasters," California's Great America Vice President and General Manager Raul Rehnborg said. "Gold Striker riders will experience the unique sensation of rapid acceleration in almost complete darkness." Gold Striker stands 108 feet tall and features a 103 foot first drop, plenty of high speed twists and turns including a covered station fly-by. 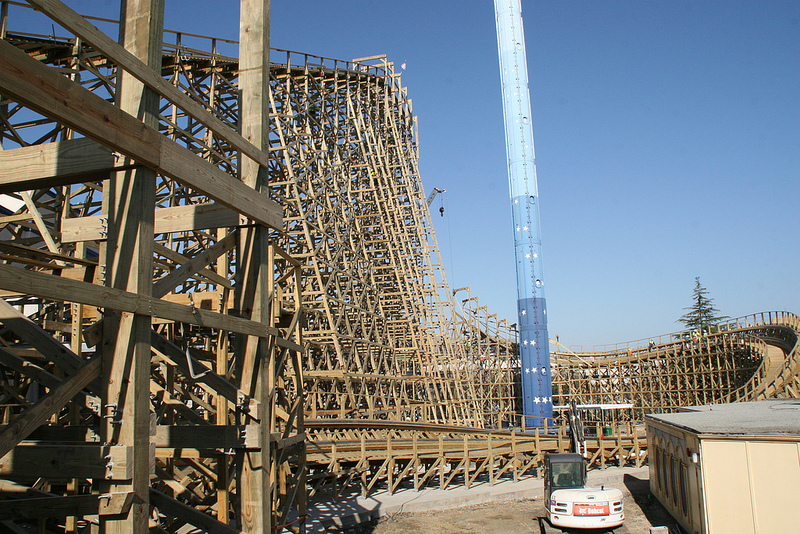 In total, Gold Striker's track measures 3,197 feet long. 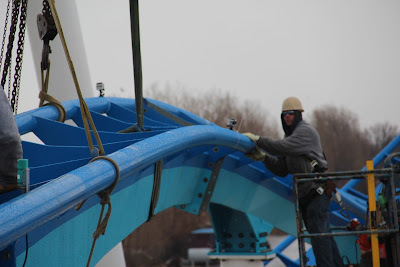 While the new coaster is the main focus of the park's 2013 season, plenty of other maintenance including new paint on many rides and buildings will have the park looking like new when it opens this year on March 29th. 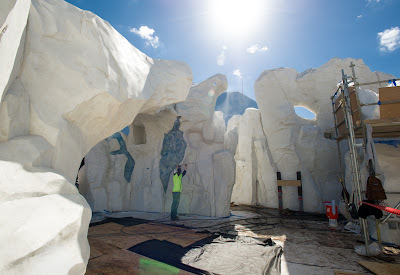 May 24th, that's the official grand opening of the all-new Antarctica: Empire of the Penguin at SeaWorld Orlando. 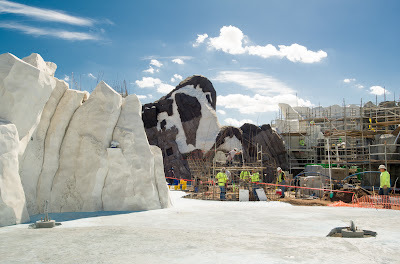 Construction of the new themed land, which will contain a high-tech family dark ride that includes interaction with real penguins, is on schedule and going well according to the park. The first of a kind family ride will utilize trackless motion based vehicles to "explore a massive penguin colony in an expanse that envelops riders in cool extremes, both above and below the penguin's icy world." To help show off the progress of the new Antarctica area, SeaWorld Orlando held a construction tour for the media today. Some great photos of the land can be seen from 13 News and Click Orlando. The area looks really neat in the Florida sunshine!